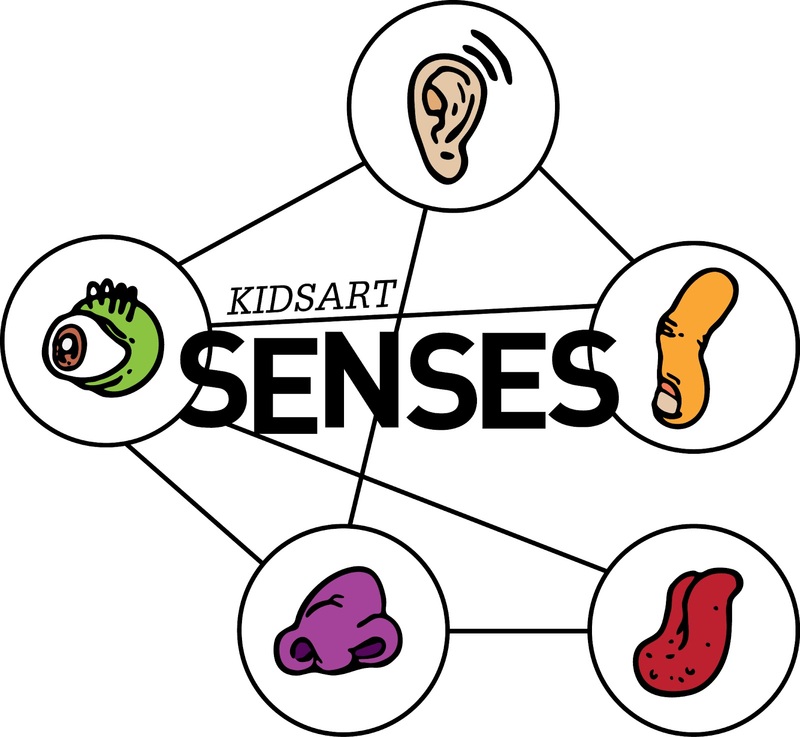 KIDSART 'SENSES' WAS A COMPLETE SUCCESS, culminating with Patricia Hernandez's SMELL camp and David Brieske's and Juan Maristany's SOUND camp. Here are some fun photos from their artistic journey and experience. 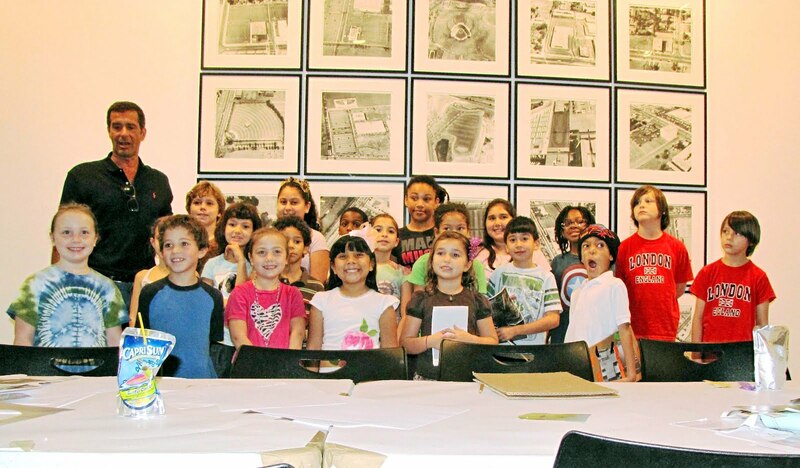 We are also very excited to announce that we are gearing up towards a new collaboration with CIFO, Cisneros Fontanals Art Foundation, where we will be conducting three sessions of art camps for children, ages 5 to 12. SAVE THE DATES: September 29th, October 13th and November 3rd. We will announce the artists very soon. 'Describe the Smell' by Patricia Hernandez. The workshop functioned in several parts. First, our team held a series of fun experiments, along with an educational component on the olfactory system and olfactory art. Then lead to a live online radio broadcast, where the students themselves shared and performed as experts on anything olfactory, describing each smell, and leaving room for them to use their own imagination. Parents and listeners were able to tune in in real time and everything was archived online. Check out our Facebook page, become a friend and receive updated news and information about Artoconecto's programs, as well as other cool art projects and initiatives elsewhere! 'Surrounded By Sound' by David Brieske and Juan Maristany. The kids were introduced to how artists collect, process and use sound in their work. The workshop took place at a scultpure studio, at the Little River Yacht Club, where the surrounding materials and tools wiere used as source material for sounds. Thanks to all the artists, volunteers, Legal Arts, the Little River Yacht Club and a very special thanks to the Miami-Dade Department of Cultural Affairs for their support! KIDSART SENSES: Taste of Color, Taste by Number: by Jiae Hwang. 'Taste of Color, Taste by Number' explored the colorful and mysterious world of taste. 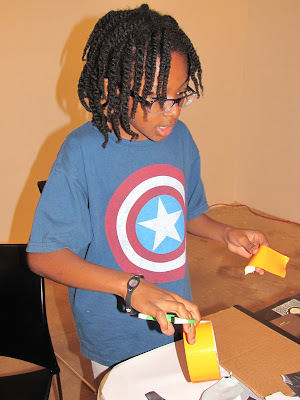 Using various tasty medium, children learnead how to play with their senses when tasked to describe flavors in a visual manner. They learned to differentiate between making art with their eyes and making art following guidance from their taste buds. A super tasty camp. Jiae and her half orange Juan welcome the kids--thanks Juan you are awesome! Ok kids ready for some tasting? Alejandro: I sense a very bright color--I have tasted this before! Starburst: strawberry, lemon, cheery, Mysterious jelly bean flavors. Afterwards, the kids used their tasting experience to recreate their experience on boards, using all types of mediums, including candy. Special thanks to our great volunteer Lauri Hand for coming over early on a Saturday to work with the kids. Also, check out the Ecomarket store, they donated all the incredible earth friendly plates and utensils the kids are using to eat their meals. 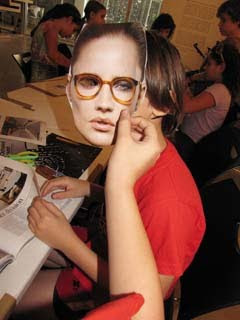 The workshop ‘Reinterpreting Form’ encouraged the kids to evaluate and rearrange common objects and materials into new and more complex forms. During this exercise, the kids explored a hidden world of possibilities that exist behind these objects and materials, while become more sensible towards them. Also, they were introduced to a selection of tools and equipment that will make the realization of ideas more viable, that may otherwise seem too abstract for them. Special thanks to: Catalina Roca and Camila Gonzalez--our great assistants. Also, thanks to Raiza Perrault from Ecomarket Store for providing us with the mosta amazing earth friendly plates, utensils and plastic bags!!! Miami, June 2, 2012. 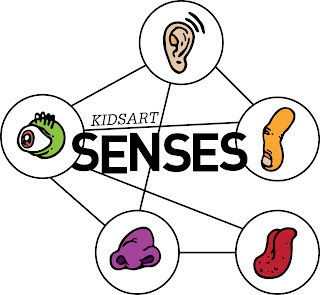 Artoconecto’s KIDSART returns this summer with an exciting new series of affordable art camps for children in the Miami area, designed to stimulate all five senses, as well as linking the artsand the sciences in a fun and innovative way. The list of prominent Miami artists who will be leading the weekly camps includes Mauricio Gonzalez, Jiae Hwang, David Brieske, Juan Maristany, Patricia Hernandez and Hannes Bend. Each will focus on asingle sense: sight, smell, hearing, taste, and touch, respectively. They will create a sensory experiencefor the kids that will not only arouse their perceptions of the world aroundthem, but remind them as well of their significant place in it. “We often take our senses for granted,” says Alexandra Rangel, Executive Director of Artoconecto. “We move around without realizing their importance in perceiving and defining the cognitive imagery that allows us to interact with the world around us. 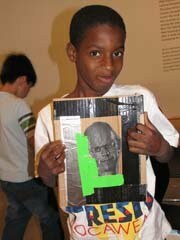 Most of us don’t realize how lucky we really are to be able to possess all of them.” These camps will bring each sense into focus by adding the artists’ ‘sensibility’ to them, and demonstrate to the kids how precious and unique each sense is. 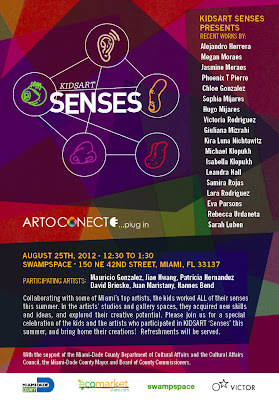 For three years, the local non-profit Artoconecto, with the generous support of the Miami-Dade Dept. 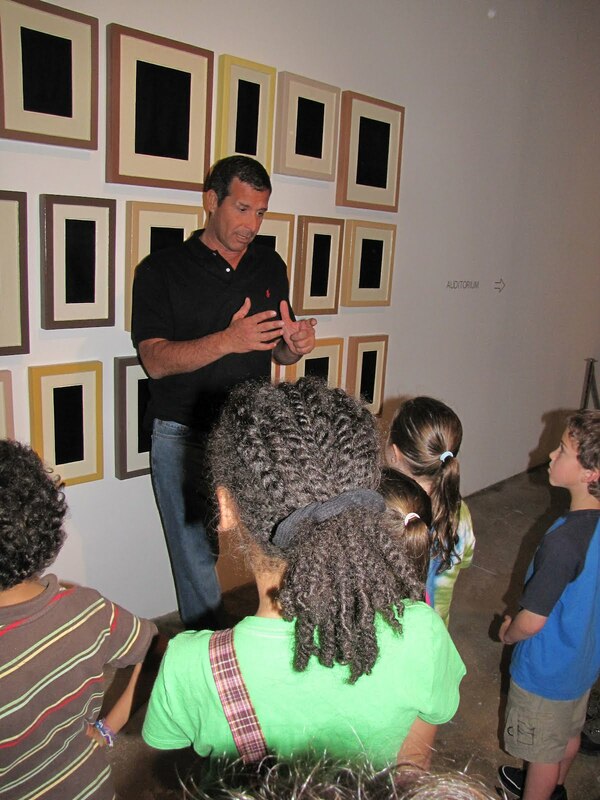 of Cultural Affairs, among others, has conducted affordable art camps for children with notable artists in the Miami area. Last year, camps were also conducted simultaneously with camps in Croatia. 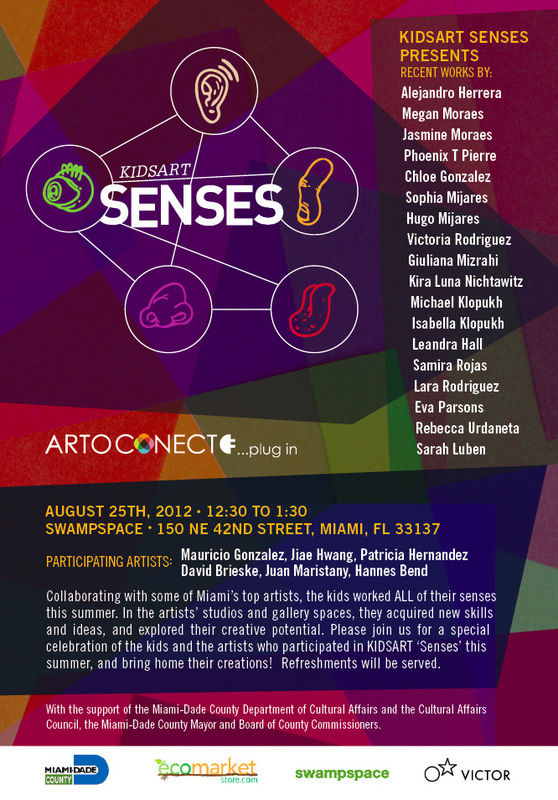 ‘The Senses’ art camps will comprise a diverse group of artists, from different parts of the world, who have chosen Miami as their base camp for creation. Registration is open to all children in Miami. KIDSART takes place on five successive Saturday mornings, from July 28ththrough August 18th, at various artists’ studios. The cost is a donation of $100 dollars per child, which includes all materials and lunches for the duration of the camps. 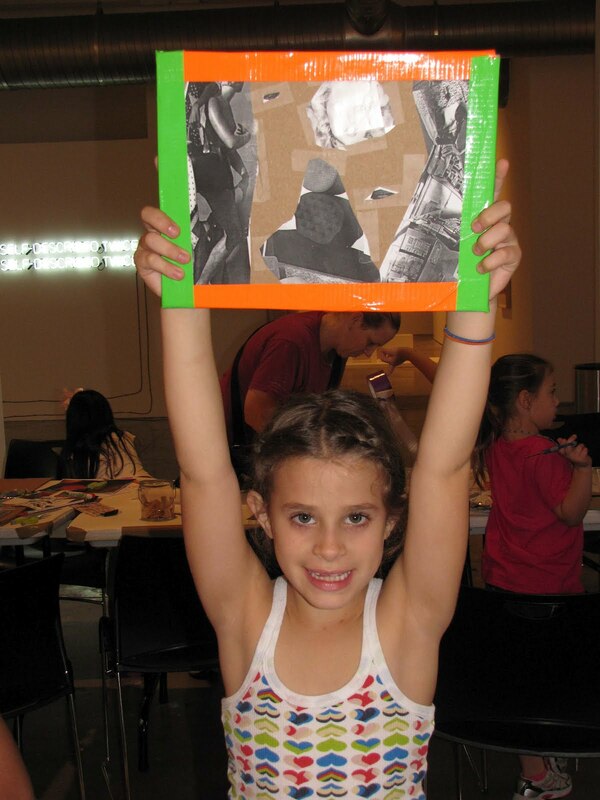 KIDSART@CIFO: Understanding Materials Through Desconstruction by Agustina Woodgate. exhibition Frames and Documents: Conceptualist Practices, Saturday, March 3. For this workshop kids will be asked to bring an article of clothing they could dispose of. Using these garments Woodgate will explore the understanding of materials through deconstruction, dialog and storytelling and guide children through the process of finding meaning in all their decisions and transformations. 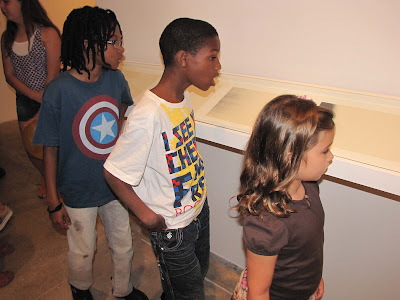 The kids will also be taken on an insightful tour of the exhibition Frames and Documents: Conceptualist Practices highlighting works that inspired this activity. 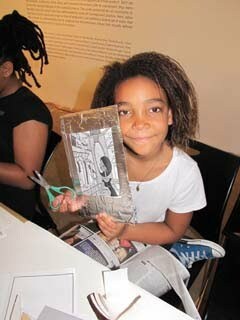 Cost includes full entertainment, professional instruction, all materials, take home projects, and a snack! Join us and Miami-based artist George Sánchez-Calderón on Saturday, January 28th for the first Family Cultural Spot of the year! Drawing inspiration from the many works in CIFO's current exhibition, Frames and Documents: Conceptualist Practices, the children will be led through a guided tour of the exhibition and a hands-on activity that explores the transformative qualities of everyday objects. 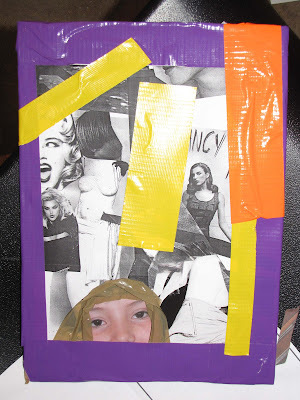 Using photography, copy machines, and an assortment of everyday materials kids will learn about the cultural significance of artworks and alternative modes of art making. George Sánchez-Calderón received his Masters degree in Fine Arts from the Rhode Island School of Design in 1995 and Bachelors degree in Fine Arts from Florida International University. 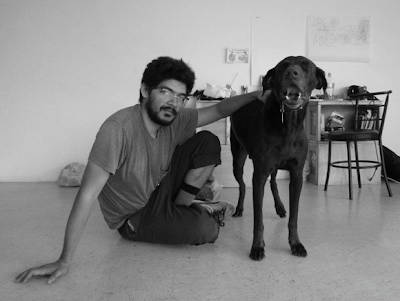 His work is in the permanent collection of the Miami Art Museum, the Museum of Contemporary Art, North Miami, Margulies Collection, Craig Robbins Collection and the Carlos and Rosa de la Cruz collection. Mr. Sánchez-Calderón is also the recipient of the Oscar B. Cintas Fellowship and the South Florida Cultural Consortium Award. 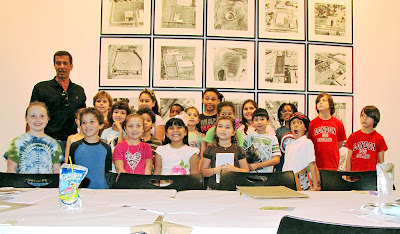 Donations to Artoconecto/KIDSART, a 501(c)3 arts non-profit, are tax deductible! CLICK ON THE IMAGE FOR KIDSART blog! ARTOCONECTO is a non-profit arts advocacy organization based in New York City, dedicated to creating and promoting unique artistic projects. 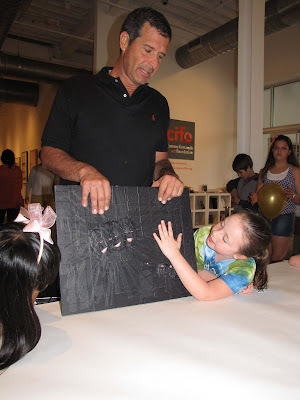 Artoconecto pioneered the concept of the pop-up gallery, creating enormous roving art ‘galleries’ in non-traditional venues in Washington D.C. and Miami. We strive to present the most dynamic artists we can find, and provide them the platform and the tools to both engage the public, and to take bold new risks. We also believe that the arts should have a part in every child’s life, and KIDSART, which brings children into working artists’ studios, is our first program designed to introduce children to the rich cultural and artistic diversity of the community. Our goal is to continue to expand the dialogue between the artist and the community, and to shine a bright light on creativity in the public realm. (c) Artoconecto, a 501(c)3 Tax-Exempt Arts Non-Profit... Awesome Inc. theme. Powered by Blogger.